FightingArts.com - Bodhidharma: Myth or Reality? At a minimum he was a remarkable man. He was but one of hundreds, if not thousands, who ventured far distances from India and elsewhere to China to teach. And while virtually ignored historically in that country, now after almost 1500 years he is venerated in Japan, as the great religious figure - part mystic and part guru - that originated Zen Buddhism. Bodhidharma's life has become the stuff of fables and legends - of mysterious sightings and life after death. It was reported that he crossed a river floating on a reed. And long after his death he was seen walking along a road wearing only one sandal. The mystery deepened when his tomb was later opened and found empty - save for a single sandal. These and other stories have been immortalized over the centuries in legends and in paintings, on scrolls and wood block prints. His image is easily recognized - a thick rounded body, swaddled in robes, heavy jowls, with thick bushy eyebrows and beard that frame large round eyes that captivate. One Chinese official reported after meeting him and witnessing his penetrating, intense stare that Bodhidharma was the most intimidating person he had ever met. 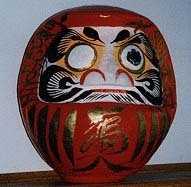 In Japan today his likeness is most popularly found in homes and businesses characterized in the form of a round red "Dharma" doll, comprised of a large face, shoulders pushed down into the trunk and without a neck or body. The doll is weighted at the bottom so if pushed over, it ever rights itself, symbolizing perseverance through life. The story goes that Bodhidharma meditated cross-legged facing a wall so long that he lost his legs, thus the doll's shape. To keep from sleeping he also cut off his eyelids and threw them to he ground, from which grew China's first tea plants. And that's why, it is said, Zen monks even to today drink tea to keep themselves awake during meditation. When purchased Dharma dolls have blank eyes. It is customary to paint in one eye to symbolize the beginning of a project or challenge and to paint the second eye upon completion. But what is historical fact and what is mystical legend? What made this hermit adventurer, this fierce, enigmatic bareheaded and scowling monk so remarkable? It was his revolutionary, crazy wisdom that forever changed Buddhism in China and produced what the world now calls Zen, a religion and way of perception that became central to the Samurai warrior tradition and later martial arts. He is also credited with inspiring the martial arts in China and creating mystical teachings of health and longevity (chi Kung). In this multi-part series we will examine Bodhidharma and his association with the legendary Chinese Shaolin temple, and delve into the truth about his association with the martial arts and healing arts. The truth is, as with many ancient Chinese legends, both contradictory and surprising.